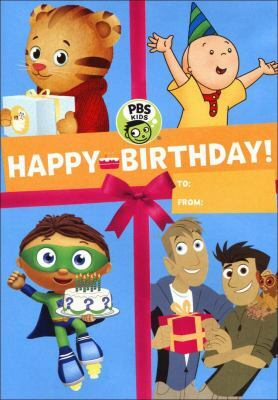 PreS-Gr 2—This DVD packs 10 episodes featuring popular PBS characters, from Arthur and Daniel Tiger to the Wild Kratts and the Odd Squad and several more. Each segment focuses on birthdays and how to celebrate them with meaningful activities and gestures. For example, the Kratt brothers learn about porcupines while searching for the perfect gift for biomechanical engineer Aviva. Dog (WordWorld) is saddened that no one remembers his birthday, but unbeknownst to Dog, his friends are planning an exciting party for him back at his house. Among the subjects visited in these stories are teamwork, math (counting, addition, patterns), science, and positive thinking. The disc also includes a past episode from Reading Rainbow in which several library patrons plan a surprise birthday party for LeVar Burton at the local bookstore. VERDICT All in all, the DVD will bring smiles to many young faces, and viewers will surely rehash their fondest memories of past birthdays while looking forward to their next one.